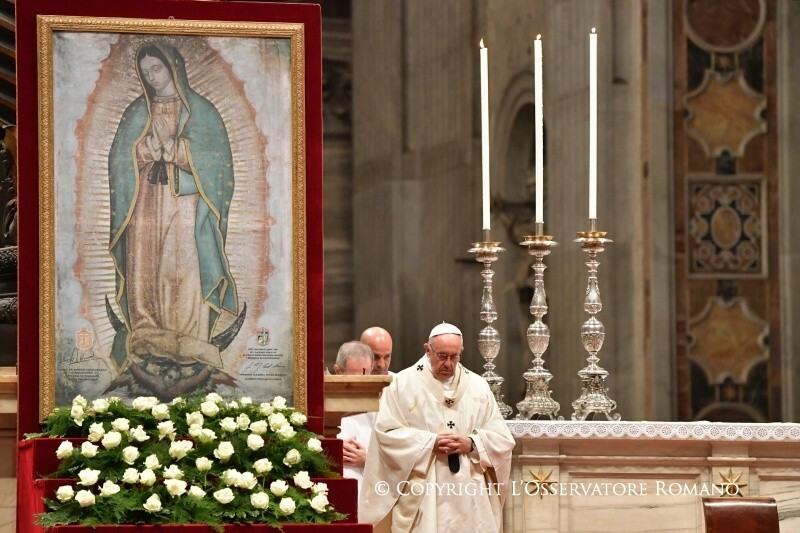 Pope Francis celebrating Mass on the feast of Our Lady of Guadalupe, in St. Peter's Basilica, Dec. 12, 2017. The Gospel that has just been proclaimed is the preface of two great canticles: Mary’s canticle known as the “Magnificat” and Zachariah’s canticle, the “Benedictus,” and I like to call it “the canticle of Elizabeth or of fecundity.” Thousands of Christians throughout the world begin the day singing: “Blessed be the Lord,” and they end the day “proclaiming His greatness because He has looked with kindness on the littleness of His own.” Thus, day after day, believers of different nations seek to remember, to remember that from generation to generation God’s mercy extends to all the people, as He promised our fathers. And in this context of grateful memory, Elizabeth’s song blossoms in the form of a question: “Who am I that the Mother of my Lord should come to visit me?” We find Elizabeth, the woman marked by the sign of sterility, singing under the sign of fecundity and astonishment. I would like to underscore these two aspects: Elizabeth, the woman under the sign of sterility and under the sign of fecundity. Elizabeth, the sterile woman, with all that that implied for the religious mentality of her time, which considered sterility as a divine punishment, fruit of her own sin or of her husband’s. A sign of shame borne in her own flesh or for being considered culpable of a sin that she didn’t commit or for feeling herself a little nothing not being up to the measure of what was expected of her. Let us imagine, for an instant, the look of her relatives, her neighbors, of herself . . . sterility, which cuts deep and ends by paralyzing one’s whole life. Sterility that can have many names and forms each time that a person feels in his/her flesh the shame of seeing her/himself stigmatized or feeling her/himself a little thing. And, together with Elizabeth, the sterile woman, we contemplate Elizabeth the fecund-astonished woman. She is the first to recognize and bless Mary. She it is who in her old age experienced in her life, in her flesh, the fulfilment of the promise made by God. She who could not have children bore in her womb the Precursor of salvation. We understand in her that God’s dream is not nor will be sterility or stigmatizing His children or filling them with shame, but to make blossom in them and from them a song of blessing. We see it in the same way in Juan Diego. It was in fact he, and no other, who bore in his [tilma] the image of the Virgin: the Virgin of dark skin and mestizo face, sustained by an Angel with wings of quetzal, pelican and macaw; the Mother able to take on the features of her children to make them feel part of her blessing. It seems that again and again God is determined to show us the stone that the builders rejected, which becomes the corner stone (Cf. Psalm 117:22). Dear brothers, in the midst of this dialectic of fecundity-sterility let us look at the richness and cultural diversity of our peoples of Latin America and the Caribbean, it is the sign of the great richness that we are invited not only to cultivate but, especially in our time, to defend courageously from all attempts to homogenize, which ends by imposing – under attractive slogans – only one way of thinking, of being, of feeling, of living, which ends by making invalid or sterile all that we have inherited from our elders; which ends by making us feel, especially our young people, a little thing for belonging to this or that culture. In short, our fecundity calls us to defend our peoples from an ideological colonization that cancels the richest <part> of them, whether they are Indians, Afro-Americans, mestizos, peasants or suburbanites. The Mother of God is figure of the Church (Lumen Gentium, 63) and from her we want to learn to be Church with a mestizo face, with an Indian, Afro-American, peasant face, or a boy or girl, old or young man, so that no one feels sterile or unfruitful, so that no one feels ashamed or a little thing. But, on the contrary, so that each one, like Elizabeth and Juan Diego, feels him/herself bearer of a promise, of a hope, and is able to say from his/her innermost being: “Abba!, namely, Father! : (Galatians 4:6) from the mystery of that filiation that, without cancelling each one’s features, universalizes us constituting us a people. Brothers, in this atmosphere of grateful memory for our being Latin Americans, let us sing in our heart Elizabeth’s canticle, the song of fecundity, and let us say it together to our peoples not to tire to repeat: Blessed art Thou among women and blessed is the fruit of thy womb, Jesus.